Renovated in 1907 by Architect Wm. 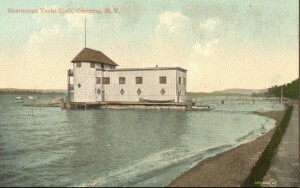 H. Rahmann, the clubhouse became a noted landmark along the Hudson River. It was featured on this penny post card of the day. Resembling a riverboat, with its gangway to shore, it provided entertainment and recreation for the gentlemen of Ossining and their guests. Shattemuc Yacht Club’s roots can be traced to the old Sing Sing Yacht Club, which held its first regatta in 1858, over 156 years ago! Although that club became extinct, there was active canoe sailing in the late 1870’s and early 1880’s, and talk of organizing another club. What eventually became our club was first incorporated as the Sing Sing Yacht Club in 1888. Our history is rich with boat races dating back to the earliest days and continues even today. Much of our history has been lost over time, but thanks to the interest of some of our members who have carried out diligent research, it is slowly being recovered. The result of their efforts, which are on going, will be presented here as a collection of volumes, each one covering a period of the club’s evolution. Over time, an index to all of the volumes available will be constructed to facilitate an exceptional historical record. Of course, each of the volumes, like many books, is a work of art, and thus will reflect the taste of its author. So you can expect that they will not all look alike. Within each volume, you will find written text, pictures, maps, drawings, and a wealth of hypertext links that makes reading them not the usual linear process, but rather a multidimensional exploration — an exciting adventure. The first volume to be presented is the result of the efforts of Bill Sparacin, who, unfortunately, passed away in 2009, before he was able to finish the complete work. Here’s an extract of the beginning chapter that will lead you through our history and very much the history of the Hudson River.